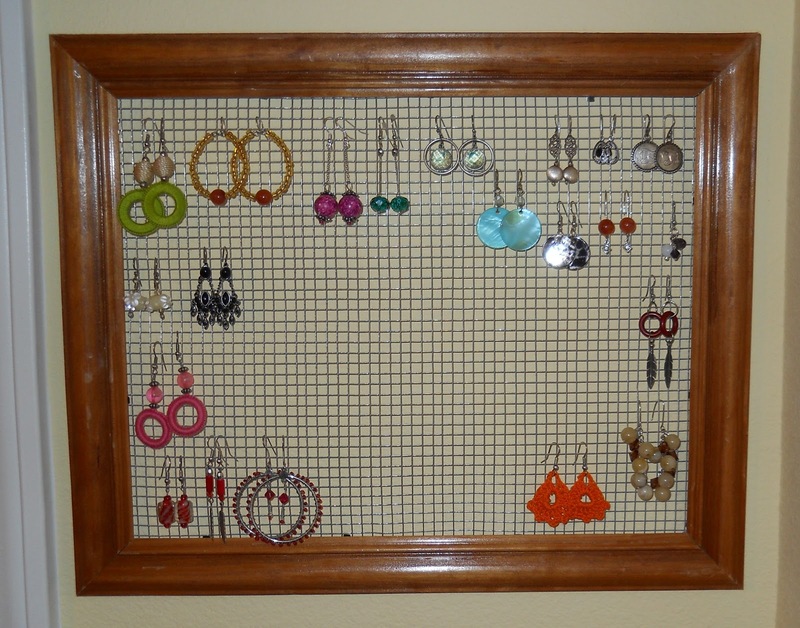 I made this earring holder back in 2009, and have loved it! It hung in such an easily accessible place (I pass it on the way to my bathroom) so I was wearing them a whole lot more than I used to, and I could see what I have so quickly. 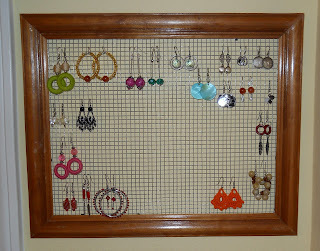 But my earrings have grown bigger, and my collection is bigger, and I had outgrown this rack. SO, I went by my local hardware store this morning and bought some 1/4 inch hardware cloth and cut it to size with my hubbies wire clippers to fit a frame I'd picked up at a thrift store. I used the tabs that were already in the frame and folded them down to hold the hardware cloth in place. Then I hung it on the wall. I was on the phone with my mom almost all the way through this project, and it still only took about 30 minutes to do! I started with a piece of chain that I cut in half, and then hung from the middle on earring wires. Then I put 4 red beads on a pin that I made loops on either end of and hung it from the chain. I played with it for a while before figuring out what beads to hang, then put the iridescent white and red beads on headpins and formed loops to hang them between each red bead going across. 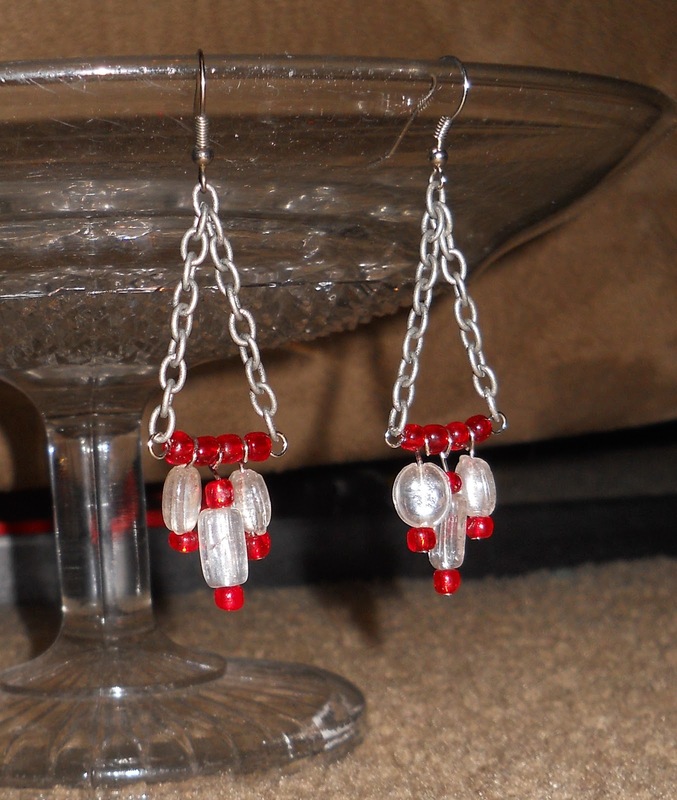 I used all glass beads, because I like the look and feel of glass over plastic. I had one of those dollar store necklace and earring sets that I was not crazy about. I loved the beads, great purple color, nice weight to them, everything. But the necklace was set on multiple strands of fishing line and I didn't like the look. (I know I should have taken a before shot!!) 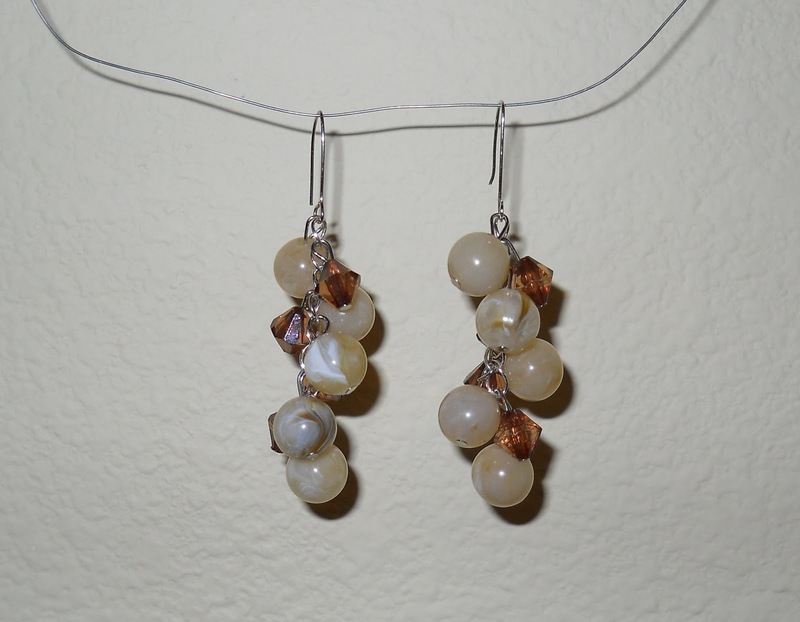 And the earrings were one drop bead. Very plain, and barely showed up. So I decided to take the beads off and start over. 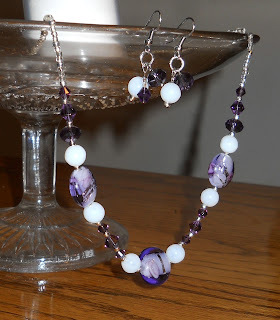 I took the beads off, added a few more purples and the white spheres that I had and liked it ok, but it needed something else, so I put silver spacer beads between each bead, and then I loved it! I made the back very simple but used some silver sead beads and some more of the spacer beads to make sure it still sparkled. Then I got to work on the earrings. The largest purple bead was the original. All I did was add a jump ring above that bead, and put some matching beads on their own head pins, added those beads to the same jump ring, and now it shows up great and has some character! I am on a jewelery kick. I love making new things to wear to update my wardrobe. Someone had given my daughter some beaded bracelets with memory wire a few years ago to use for craft projects, and I can't wear memory wire bracelets because they drive me crazy with the tightness on my wrist. (But can't stand to throw anything away that I might use later!) So, I thought of a use for it! I cut the wire smaller and strung on gold and orange beads. 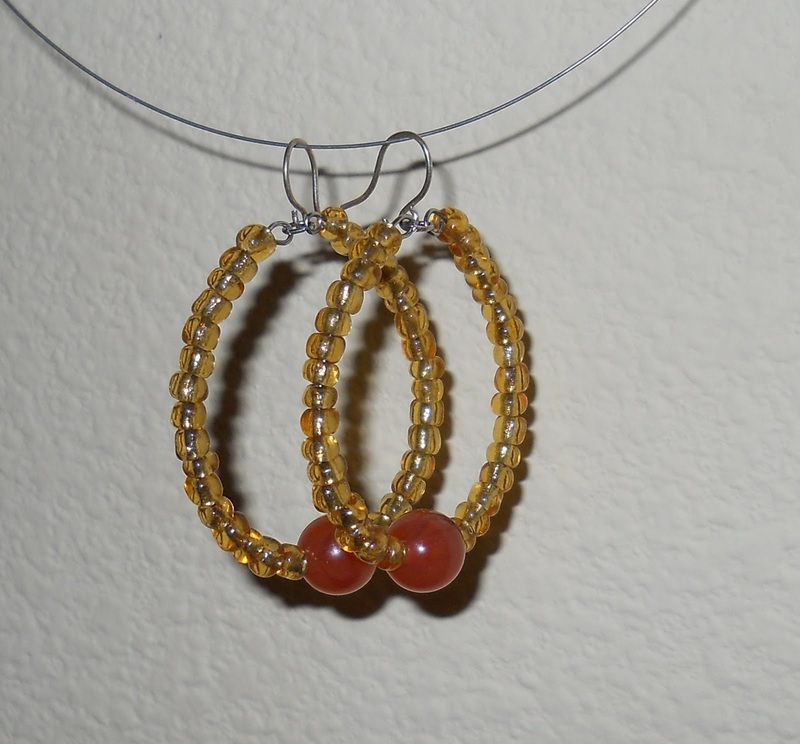 I added loops to the ends, and an 'o' in the middle and hung them from earring wires. The finished hoops are 1 3/4 inch from top to bottom, and the memory wire keeps them in a tight strong loop, so they're not floppy like string would be. They are great fall colors and I wore them yesterday with a sweater that matched perfectly! Now if I could only get our 11 month old to stop yanking on them, I could enjoy them a lot more! I made these along with the last pair, and thought they needed something else, but wore them yesterday and decided to leave them just as they are. I used a length of chain that I already had, which I connected to earring wires. Then I put each bead on a pin, created a loop and attached each loop to a link in the chain. 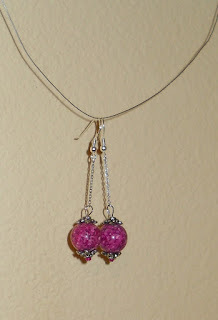 I had enough to do matching beads on every other chain link. They move around randomly, and don't look like a perfect "every-other" pattern, and I like it that way. I had thought they might need another bead too, you know three's a charm, but don't want to add the weight or the bulk to them. I only had to make one buy for these, and that was the actual earring hooks. The chain is from a necklace that was very small and has been sitting around for ages. The two colorful beads, which made me start on these earrings in the first place, I think were from back in my high school days, and the other findings were hanging around the craft closet! It was pretty simple. I put a small pink seed bead, and the silver beads around the big colorful ones on a pin, created a loop at the top and put them all together. The hardest part was getting that tiny little chain to go onto the hooks at all! I think I will really enjoy this pair! I think the second pair might still need some work....so I'll show you another day!